Hi! 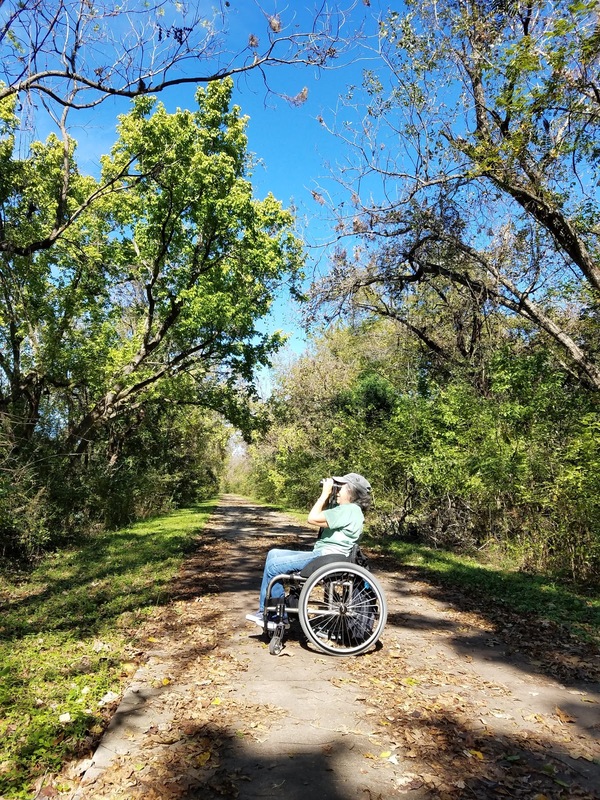 For those of you itching to get outside on a trail that goes for miles, the City of Austin has constructed a dream trail for runners, cyclists, AND people in wheelchairs! If you have not yet been on it, you are missing something. I have been watching construction of the Southern Walnut Creek Trail, or "the Nut," for years. Below see a link. You can see the 13-mile,10-foot-wide sidewalk curving away and around through the woods from several adjacent roadways, including U.S.183. 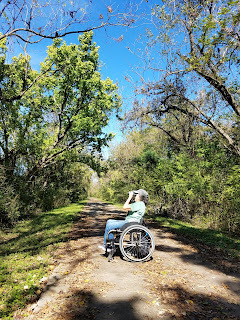 When I see an accessible trail, I HAVE TO GET ON IT! IT IS CALLING MY NAME! And so, during the last couple of years, I have done sections of the trail at a time. The trail may be calling your name, too! Listen! Yesterday, Judith joined me. We started at the YMCA at 51st and headed south. We went about 1.5 miles, so, 3 miles round trip. We were birding the entire way, so speed was not the game. 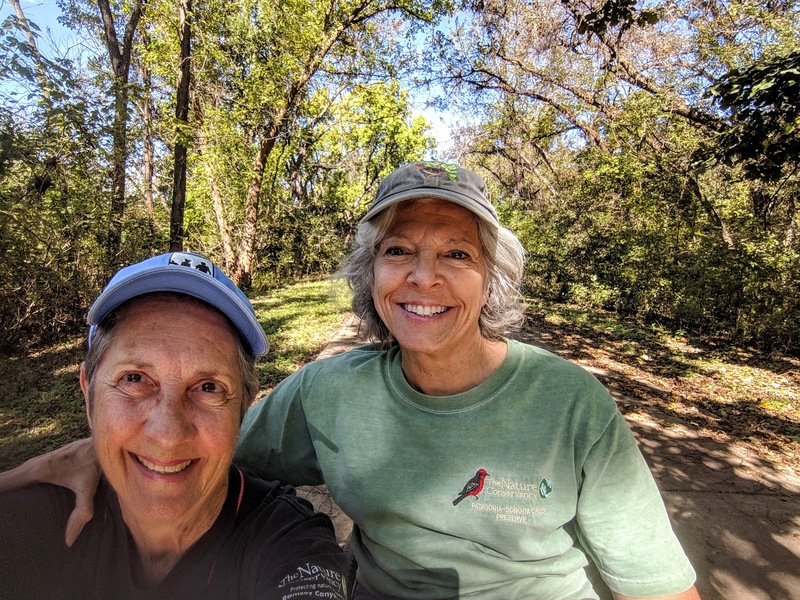 Today, Celeste and I started at Govalle Park, the southernmost trailhead of the Nut, and headed north. We did another easy 2-mile section, so, 4 miles round trip. The sky was SO BLUE! The air was cool, the yellowing hackberry, cedar elm, and sycamore leaves raining down on us. Monarchs, Queens, snouts, and orange sulphur butterflies floated gracefully all around us, in and out of the sunny patches. Crushed pecans covered the path, staining it dark purple and crunching constantly under my wheels. Our shadows were before us and behind us as we went. Glorious day! Northern mockingbirds kept up a militant banter, and Carolina wren males sang their beautiful songs, followed by the female's dutiful chatter. Yellow-rump warblers romped hither and yon among the canopy, and an orange-crowned warbler took us on a three-minute chase as it skittered quickly from twig to twig. Seven Monk parakeets, like loud rowdy school boys, raced above us in a blue playground. White-winged doves sulked in cedar shadows and stampeded madly in small herds over our heads. One dove masqueraded as a hawk on a far away snag until a white arc on a wing brought us to our senses. Black vultures wheeled above in paired choreographed circles, their white wing tips catching the sun. A belted kingfisher clattered above us and disappeared down the waterway. Under U.S.183 now, birds darted into mud swallow nests adhered onto the concrete rafters. We believed them to be swallows--considering--but as we watched their heads appear at the clay openings, black throats, gray caps, and white cheeks gave them away as opportunistic house sparrows--or house swallows as we joked. An osprey with its fierce face and impossibly long wings like boomerangs sailed serenely by. Northern cardinals in their incredible redness flew in and out of the red-berried possum-haw, chipping their metallic pink, pink, pink. Red-bellied woodpeckers chunk-chunked and flew in swoops, like the way your hand moves outside a speeding car window, up and down, up and down. Downy woodpeckers did their descending whinnies, and blue jays practiced their red-shouldered hawk cries, but did not fool us. Rounding a bend, we stopped talking and walking and wheeling in mid-stride. Before us the red-shouldered hawk lorded over his space directly above the path. Respectfully, we moved toward him and then beneath him. He looked directly at us, unperturbed. We continued on, feeling honored. Red-winged blackbirds clucked their way overhead, red epaulettes shining. Eastern Phoebes identified themselves and celebrated the entire day, sallying out and away and back again, their pale yellow fall plumage bright against the greens and blues. Chickadees trapezed about high in the trees, seemingly attached to invisible lines, uttering their lovely four notes and calling each other by name. Two titmouse cartwheeled into view, one following the other through the trees, preceded by a high-pitched thin note and ending in a fussy scolding. I departed feeling as though I had spent the day in an A. A. Milne Pooh forest, visiting one beautiful feathered character after another. Days like these feed my soul, nourish my spirit, and send me home with visions and songs in my head and my heart. Cannot wait to go again. Amazing! Beautiful and poetic images. I can’t wait to tag along on your next visit.